You are viewing articles tagged airport. The Metrorail opened in 1984. This weekend, the track that connects it to the Miami International Airport finally started transporting passengers. Let’s take a ride, check out the route, the new station, the Miami Intermodal Center, and how it all connects to the airport. And yes, let’s complain about the fact that this took 28 years. A modified version of the MIA Britto shirt has been approved and ordered, so get ready to puke at the airport. Miami International Airport employees are being sent to customer service training at Walt Disney’s Disney Institute. After more then a decade and a billion dollars, the new terminal at MIA is going to open August 29th. Back in April on returning from Bogotá, I snapped a series of pictures from the plane flying in to Miami International Airport. Here they are, annotated. 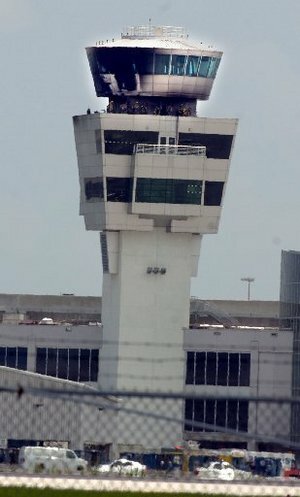 “Hot tar spilling out of a roofing kettle ignited a fire Wednesday afternoon at an under-construction gate-assignment tower at Miami International Airport.” No, not the main tower, and yes, everything’s fine. Here’s the story, but do you see something peculiar? In the photo, by Herald photographer Tim Chapman, there’s a little halo around the top of the tower, which is often a telltale sign of photoshopping. I guess the Herald considers a little digital burn-n-dodge Kosher, but you’d think at least they could be a little less sloppy about it. Here’s the photo, for when the Herald yanks it. The (Ft. Lauderdale) airport expansion, she is approved. Meanwhile, the power plant is denied. Update: “I probably would have voted no, but I don’t really care. This place is already ruined anyway.” — anonymous Pulp advisor. Break me a give — everybody’s up in arms about (granted, another) $4 million budget shortfall at the Carnival Center, but a $503 million budget overrun at the airport barely gets noticed. 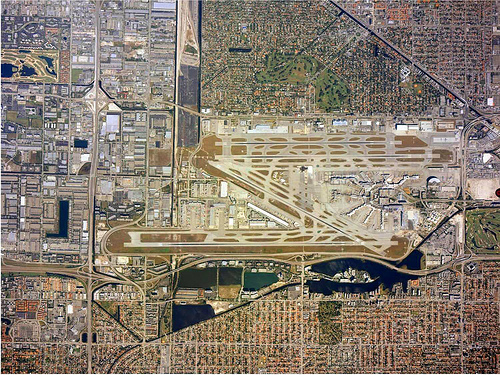 Trouble for the Miami Intermodal Center? 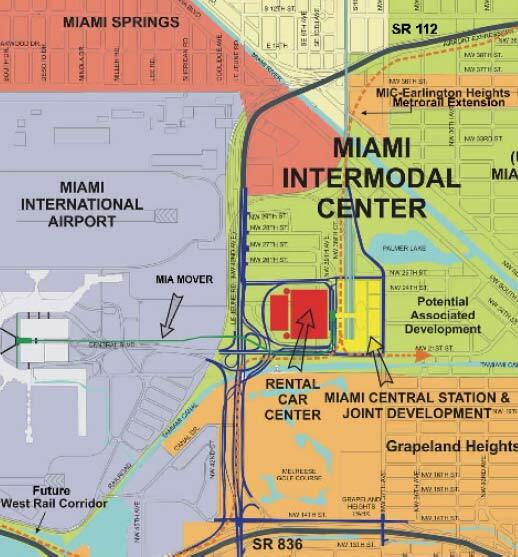 The currently favored plan has the Metrorail extended to the Miami Intermodal Center, with a people mover covering the last stretch to the airport. MAP (the yellow thing is the MIC). My friend and co-worker Tiffany Hill flew home for Thanksgiving, and she told me about her terrible experience with Miami International Airport, which she says is the worst airport she’s ever seen. I should point out that Tiffany is a very experienced traveler, and that her criticisms are not particularly related to the Thanksgiving rush. First, she was directed to an “Economy Park and Ride Lot” for long-term parking. This was by an attendant, after she’d entered the complex; there was no sign on the way in to direct one to the lot. So already she’s had to enter the airport, leave, and come back, just to park. Then there’s supposed to be a bus that takes folks from the lot to the terminal, but none was to be found. She eventually discovered that an MIA employee-only bus went to the terminal from an adjacent employee parking lot, and the driver gave her a ride. On her way back, another driver of the bus closed the door in her face without offering any other advice (and another one eventually gave her a ride). As you drive around the airport, the signs that tell you what airline is in each area are almost impossible to read while driving by in a car. Inside, the information display terminals that tell you which gate to go to are nowhere to be found because they’re . . . at the gates!! Who designed this place? Miami airport to train all 35,000 workers to spot suspicious people. Farecast is a service that tracks the price history of an airline ticket and tells you whether the price will go up or down, and whether you should buy the ticket now or wait. It has only supported flights from two airports, but is now open to 55, including Miami and Ft. Lauderdale!